Grow Tomatoes in Cheyenne, Wyo. Silvery Fir Tree Tomato is a short-season heirloom variety I grew in 2013. I have seen the tomato forest, right here in the heart of Cheyenne, and I want to tell you about it. Because my initial tomato gardening experience this summer has been essentially problem-free, I thought I should find someone to talk to who has much more tomato experience, for the benefit of any of us that need advice. That is how I found myself immersed in Michelle Bohanan’s tomato forest, though perhaps “jungle” would be a better term since plants seemed to be climbing on each other to reach the best sunlight. Michelle, a Laramie County Master Gardener, grew 40 varieties of heirloom tomatoes from seed this year, one plant of each, down from 70 varieties last year. Each plant gets its own over 5-foot tall, 16-inch-diameter cage formed from concrete reinforcing mesh—the kind with the wires welded about 6 inches apart—wide enough to reach through to pick fruit yet suitable for tucking in a straying branch. The tomato plants are spaced about three feet apart in the main tomato patch in the side yard and tucked into other spaces as well. By the time I visited Aug. 22, some plants had shot up and spilled over their cages, summer squashes were climbing the outsides of others, winter squash filled the paths between, hiding basketball-sized fruit, and tassels of corn waved overhead. Beans and parsnips added to the solid mass of dark green leafy textures. Flowers punctuated the vegetables and overflowed the flower beds. This island of vegetative exuberance was only six or seven years ago a desert of pea gravel spread over native clay soil. Michelle has worked bag after bag of fall leaves into her beds, plus compost from her co-workers. She used to use a rototiller, but now that her beds are three bricks high, a multi-tined digging fork can do the job better. No additional fertilizer is necessary. Michelle finds heirloom tomato diversity through the Sand Hill Preservation Center and Seed Savers Exchange, both out of Iowa, as well as groups of online seed exchangers. About the end of February, beginning of March, she starts 10 seedlings of each variety. When they are big enough, she moves them to her plastic-wrapped back porch which is warmed by the sun, the dryer vent and heat escaping from a basement window. The excess plants she takes to the annual Master Gardeners’ plant sale in May. She shares some of her harvest with her co-workers and cans whatever isn’t eaten fresh. Michelle hasn’t always been keen on eating tomatoes, but now that she has taste-tested so many varieties, she has found her favorites. I was sent home with samples of five varieties, including one called “Absinthe” which has a peppery taste and stays green even when it is ripe. I was hoping someone with so much tomato growing experience could tell me what to do in case of insect pests and diseases, but Michelle has only one pest, psyllids, tiny little things that inject poison right into a tomato leaf, leaving parts of plants looking like a collection of brown and green rags, with fruit growing half its normal size. Michelle learned by saving seed from afflicted plants that they do not grow more resistant in the next generation. Rather, the next generation is more likely to succumb to psyllids more quickly. Less than 10 percent of her plants seem to be affected. Incredibly, the plants next to the afflicted ones can be completely untouched. Perhaps they attract more lacewings and ladybugs or whatever preys on psyllids. Those of us who have read the standard tomato cultivation information worry about diseases in crowded conditions, such as powdery mildew on leaves, but using soaker hoses and Cheyenne’s normally breezy weather helps keep leaves dry and those types of diseases at bay in Michelle’s garden. I attribute the success of my tomato patch (a fraction of Michelle’s, most plants growing no more than waist high) to growing in a virgin location, where tomatoes had never been planted before. I found only the occasional fruit gnawed or drilled with holes. A few of my branches became leafless, maybe denuded by the tomato hornworm, but as a percentage of overall growth we’re talking a hundredth of a percent, certainly not something needing any kind of chemical warfare. Besides, I found out tomato hornworms are just one stage in the life of hawk moths, those hummingbird-sized hoverers that enjoy my tubular flowers. What fueled my belated interest in tomato diseases and pests was rediscovering on our bookshelf “The Encyclopedia of Natural Insect and Disease Control” by Roger B. Yepsen, Jr., published in 1984 by Rodale Press. The color pictures are icky–all those chewing and sucking insects, all those viruses and funguses! Prevention seems to be the best cure. Follow good cultivation practices: Grow well-watered and well-fed plants with plenty of fresh air and sunshine. Provide trap crops that divert predators or companion plants that ward off attacks. Diversity seems to work in Michelle’s tomato patch the same way it does in wild nature. There are always varieties that resist problems more than others, or are better suited to a particular garden’s climate and micro-climate. Rather than rotating tomatoes on a three year-cycle with other crops, Michelle achieves a rotation of tomato varieties. Nearly the last thing I realized while touring Michelle’s garden was that there were no weeds in sight. She doesn’t have to weed. There aren’t any because her crops shade out everything else, though self-seeding cosmos have to be uprooted from the middle of the path to the rose garden. Michelle and I were still discussing finer points of tomato preservation when I realized twilight had deepened and the datura had quietly unfurled the evening’s choir of large white trumpets to broadcast thick perfume on the breeze. Evening primrose, which holds its petals primly vertical all afternoon, was open flat out. The petals, forming landing pads for moths, would be discarded the next day. Nicotiana, also known as flowering tobacco, another night-bloomer, should have had perfume, however, it seemed to blend with the datura. But the olfactory signals were doing their job, bringing in moths to do the pollination. And then I caught sight of something else much larger flying overhead, a great horned owl. What a great finish for an evening visit to a special garden. Jack-Be-Little gourds (one plant) – 4 (this is different from last month’s squash count as there was some confusion over which little yellow things were which). 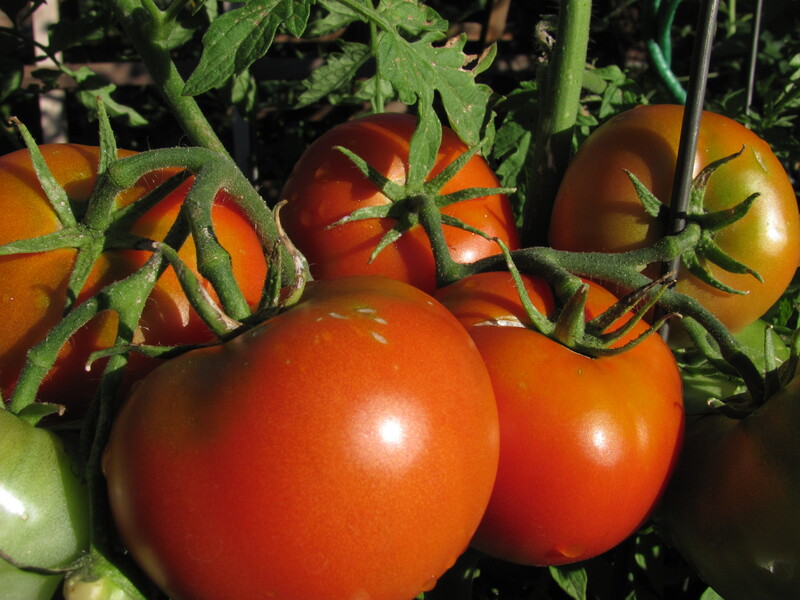 Categories: Tomatoes in Cheyenne | Tags: heirloom tomato, heirloom tomatoes, Michelle Bohanon, psyllid, tomato, tomato diseases, tomato pests | Permalink.